On some occasions the speakers sound keen to outclass each other with extravagant statements. They usually say the same kind of things, however: sometimes something like: “The production of hydrogen using environmentally friendly electricity is a major step forwards on our path to protecting the climate,” or sometimes: “The process has the potential to play a key role in the energy transition (Energiewende).” The words “innovation”, “key technology” and “power network stability” are also frequently to be heard. The people who speak such words, and where, are of less importance. What is important is the core message, which is that both in Germany and now across Europe, most of those responsible for energy policy have made a clear commitment to power-to-gas technology, which they see to be an important component in the energy supply systems of the future. Six weeks later, a similar button was also pushed in Ibbenbüren (the one there was green, however, and a lot bigger). 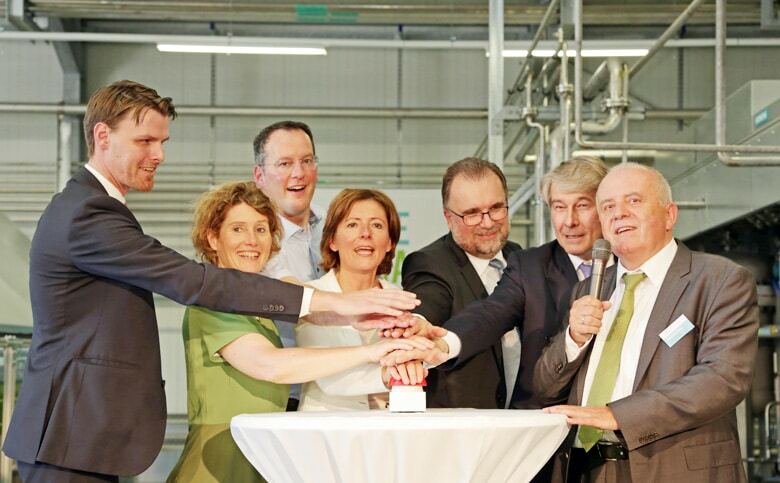 On August 17th 2015, a new power-to-gas facility was also officially opened there which, according to a press release “combines the local supply of electricity, natural gas and district heating in an efficient way”. The opening event for the facility was also attended by numerous representatives from the worlds of politics, business and the energy and science sectors. In use at the site is a PEM electrolyzer from British manufacturer ITM Power, which has a power input of 150 kW and produces hydrogen gas at 14 bars (30 m3/h). Since its excess heat is used in the neighboring pressure regulator station, where it preheats the gas, the facility has a comparatively high level of effectiveness of 86%. At the end of June 2015, the hybrid Aarmatt facility entered operation in Solothurn, Switzerland, which combines all four of the supply media of gas, electricity, heat and water. 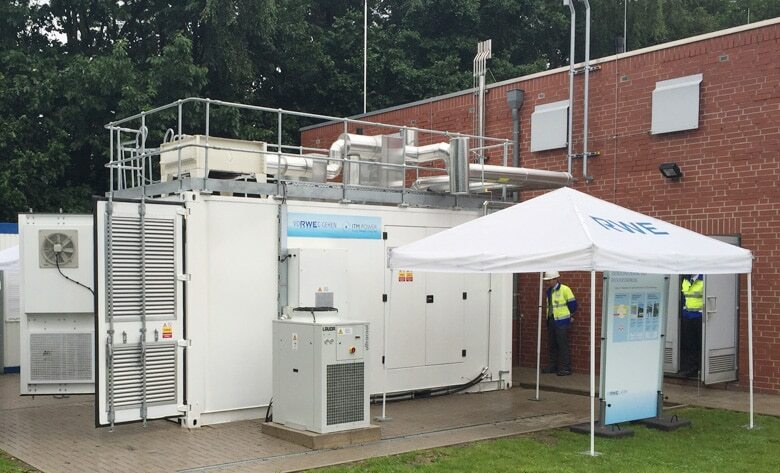 The connecting element in this pioneering project is a PEM electrolyzer from Proton Onsite (Hogen C30, input power: 350 kW), which is operated with excess electricity from renewable sources of energy. This facility, which was installed by the Swiss company Diamond Lite, is situated on the site of the Solothurn public utilities, on which a 6-MW cogeneration plant with a district heat connection has also been built. The second construction phase saw the recent completion of three 1MW cogeneration units as well as the electrolyzer, which has a hydrogen storage unit. A methanization system is set to follow later, to enable pure hydrogen or methane gas to be directly fed into the natural gas network, and for the optional use of the methanized H2 gas at the CHP facility.